Rain Water Bladder Water Storage Tanks are one of the most cost effective options for rainwater collection, storage and reuse. Low profile enough to store under decks, homes, patios or in basements, these tanks are an excellent water storage solution for areas with unused or limited storage space. 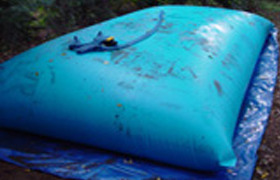 Rainwater Bladder Tanks are constructed from a flexible material that rises as the tank is filled with liquid. This design makes the tank easy to ship and small enough to fit through doorways or in tight storage spaces. Depending on your rainwater collection requirements, tanks may be built from either a standard non-potable water fabric or a potable drinking water storage material. If you have questions about these products, give us a call at 1-772-646-0597 or request a price quote. 24" x 36" x 8"
36" x 52" x 9"
48" x 66" x 9"
60" x 60" x 12"
84" x 60" x 14"
72" x 80" x 16"
84" x 66" x 14"
120" x 84" x 16"
114" x 99" x 16"
72" x 132" x 24"
108" x 132" x 16"
120" x 168" x 18"
126" x 174" x 22"
144" x 174" x 24"
162" x 180" x 24"
168" x 216" x 27"
186" x 234" x 27"
All bladder water storage tanks are available in additional sizes, dimensions and fabrics. Please do not hesitate to Contact Us for tank options not featured here. Please Note: The rainwater bladders tanks are made for stationary use. They should not be moved with liquid in them. They should not be used for transporting liquid via vehicle, boat, or other mobile transportation method. Have a Leaking Cistern Tank? For locations with leaking cisterns, we also offer a range of custom-fit Cistern Liners that can fit directly inside leaking tanks. Sized to the exact dimensions of your existing tank, these fabrics line the interior of tank to seal off the area and prevent further leaks. Liners are frequently used to increase the lifespan and reduce the costs of repairing an old unit.